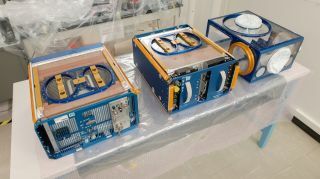 The Rodent Research Hardware System, which will be installed at the International Space Station, includes three modules: the habitat at left, the transporter in the middle and the so-called animal access unit at right. CAPE CANAVERAL, Fla. ­— SpaceX might be a few years away from launching human astronauts into orbit, but this weekend, the company is sending a miniature crew of live passengers into space. An intrepid all-female group of 20 mice will ride inside SpaceX's Dragon space capsule early Saturday (Sept. 20) when it blasts off atop a Falcon 9 rocket on a delivery run to the International Space Station. The space-bound mice will be the first residents of NASA's new Rodent Research habitat, which scientists will use to study the animals' behavior and health. NASA's past rodent astronauts that flew aboard the space shuttle rarely spent more than two weeks in space. This mission — primarily intended to test out the new habitat and hardware — will last 30 days. "Never were we able to achieve a flight experiment of this duration, so we'll get some new information," said Ruth Globus, project scientist for the rodent habitat at NASA's Ames Research Center in Moffett Field, California. The 4-month-old adult mice prepping to take flight belong to a popularly used strain of inbred black-colored lab mice known as C57 Black 6. Using cameras inside the rodent habitat, scientists will monitor the rodents' behavior in microgravity. "Rodents don't just float around and have fun," Globus told reporters here. "They tend to hold onto the walls. They move around a lot like monkeys do. They run around. They're very physically active." But that pattern of behavior could change the longer they stay in space, Globus said. Astronauts lose muscle and bone strength quickly when they go to space. And the same is expected to happen to mice. Researchers will measure the rodents' loss in bone density throughout the flight using a new X-ray machine called the Bone Densitometer. Built by Techshot, the microwave-sized instrument is also launching inside Dragon on Saturday. It will be the first X-ray source to be on the space station. Mice on the space station will get X-rays inside Techshot's Bone Densitometer so that scientists can measure their bone density. The machine will be the first X-ray system for the International Space Station. Other, less charismatic model organisms are due to travel aboard Dragon, including the yeast that causes athlete's foot, Arabidopsis thaliana seedlings to grow plants in space and 30 fruit flies. Half of those fruit flies are mutants that are particularly resistant to stressors like starvation and dehydration. "They live twice as long as their wild-type cohort," said Sharmila Bhattacharya, the principal investigator of the fruit fly experiment at Ames, which was designed by her undergraduate and graduate students. Bhattacharya and her students will look for behavioral and genetic changes in the two groups of flies. The insects are due to return to Earth with Dragon, which will splash down in the Pacific Ocean after spending a month attached to the space station. But by then, there will likely be many more than 30 of the flies; unlike the celibate mice, they're expected to multiply in microgravity. "The last time we flew 60 flies, we got 3,000 back," Bhattacharya told reporters here. The world's first 3D printer headed for space, built by Made In Space, is assembled for its launch aboard a SpaceX Dragon spacecraft. Made In Space team members Mike Snyder and Jason Dunn are shown performing the work. Having a 3D printer on the space station could allow astronauts to make tools and replacement parts that would otherwise have to be expensively delivered from Earth. And a 3D printer, built by the California-based company Made in Space, is now ready for launch. Made in Space has flown its 3D printers on hundreds of parabolic airplane flights. But the 20-to-30-second spurts of microgravity on those trips didn't offer enough time to learn how well 3D printers function off the planet, since even small items can take 15 or 20 minutes to produce. After it arrives at the space station, the printer will only produce small parts using ABS plastic — the same plastic that LEGOs are made from. But eventually, Made in Space plans to send a bigger commercial 3D printer that can make parts out of stronger, higher-temperature plastics. They even had sample of a small 3D-printed column made of regolith (loose rock present on Earth and other planets) on display here to show that one day, astronauts might not even have to bring their own raw materials; they might be able to scoop it up from the lunar or Martian dirt under their boots. 3D printing won't be the only materials science taking place on the space station in the next few weeks. The Center for the Advancement of Science in Space — the nonprofit that runs all the science research on the American portions of the space station — partnered with the sports-accessory maker Cobra Puma Golf to launch an experiment that will be aimed at making better, stronger golf clubs. "It's pretty serious science," said Mike Yagley, director of research and testing at Cobra Puma Golf. Yagley added that the research could have applications for building automobiles, airplanes and spacecraft. "There's a lot of commonality between the materials and structures in a golf club and many other things in life," he said. NASA's International Space Station-RapidScat instrument undergoes testing of its rotating radar antenna in the Space Station Processing Facility at NASA's Kennedy Space Center in Florida. The radar scatterometer represents the first scientific Earth-observing instrument to be operated from the exterior of the space station. Image released on June 18, 2014. In Dragon's trunk, there's another payload designed to improve life on Earth: a special radar that can peer through the clouds in the planet's atmosphere and measure winds swirling over the ocean's surface. "Unlike many optical satellites that can only see the top of the clouds, radar can really get to the bottom and see the wind speed and direction that affects the people on the ground," said Ernesto Rodríguez, principal investigator for the instrument, called the Rapid Scatterometer or RapidScat. Whereas scatterometers in the past flew in polar orbits, the RapidScat space instrument will take advantage of the space station's orbit, which covers nearly every point of Earth at different times of day. This data will give forecasters insight into weather patterns, destructive hurricanes, ocean circulation and even carbon sequestration. The space station's huge robotic arm — controlled from the ground — will carefully grab RapidScat from Dragon's trunk and install it on the outside of the Columbia module. RapidScat will collect data 24/7, and mission controllers hope it will be in operation for two years. It will only be turned off to avoid radiating visiting vehicles or astronauts out on a spacewalk. SpaceX has a $1.6 billion contract with NASA to fly at least 12 resupply missions to the International Space Station. The gumdrop-shaped Dragon became the first commercial spaceship to reach the orbiting outpost in 2012. On Tuesday (Sept. 16), SpaceX landed another major NASA contract — this time, to launch astronauts to the space station from U.S. soil by 2017. SpaceX will get $2.6 billion of NASA's $6.8 billion Commercial Crew Transportation Capability award, or CCtCap, to fly a modified version of Dragon. Boeing will get the rest to develop its CST-100 capsule. NASA retired its space shuttle fleet in 2011 with a goal to eventually turn over all cargo and crew transport to the private sector.